why i wanted to read it: because i'd read dash and lily's book of dares. 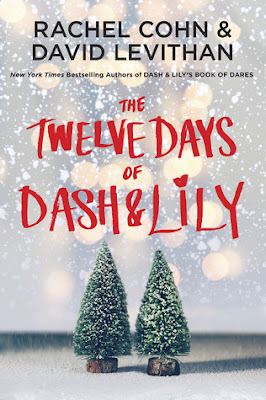 what i liked: there'd been no room in my toy soldier heart for lily, but she'd forced herself in anyway. and she'd brought christmas with her. now don't get me wrong -- it still struck me as pretty bogus to pay lip service to generosity at the end of every year only to go all generosity amnesiac once the calendar page turned. the reason lily wore it well is because she wore it all year round. and now i was able to see it in other people, too... i saw this perpetual generosity in the way some of the couples looked at each other, and a lot in the way that most of the parents (even the exasperated ones) looked at their children. i saw pieces of lily everywhere now. i'd just seen fewer of them in lily (page 6). "so," mrs. basil e. said, eyeing him with both curiosity and a desire to kill a cat, "you're the rapscallion's father." my father straightened up a little at that. "guilty as charged. or at least that's the story his mother told me." "oh -- and you're rakish as well! i've often found it helpful to have a shovel around when you're dealing with a rake." "and i, sir, am not very sure you lead. but no matter" (page 38). "good lord, i know when i'm not wanted," my father huffed. "i'll see you in the morning, dashiell." "he loves you," leeza said once he was gone. "you shouldn't be the one telling me that," i replied. while she went out to to the closet to get some new sheets, i texted lily with the invitation to breakfast. it was late, so i wasn't expecting her to be up. but she responded right away, excited. "lily's on board for gingerbread pancakes," i told leeza when she returned. then i took the sheets out of her arms; i could make my own bed. "lovely!" she said with compensatory cheer. "is there anything else i can do for you before i head to bed?" tell me why you're married to my father, i didn't say. tell me that when i make mistakes they're going to be my mistakes, not his mistakes (page 174). "how do you get good at this whole dating thing?" i asked boomer. part of me couldn't believe i was asking him this. but a bigger part of me really wanted to know. "i don't think i'm good at it," boomer told me. "but when i'm with sofia i'm not really thinking about whether or not i'm good at it, which is what makes it good. then i go home and worry. but then i'm back with her and it's good again. i think that's what dating is" (pages 198-199). what sucked: i was bored pretty much through the entirety of this book. having said that: the ending of the first book annoyed me. the ending of this one was better. maybe i like dash. maybe i like lily. but i don't love reading about them.